Timely auto maintenance is crucial to keeping your car running properly. More than that, it ensures you can operate your car safely, as well. 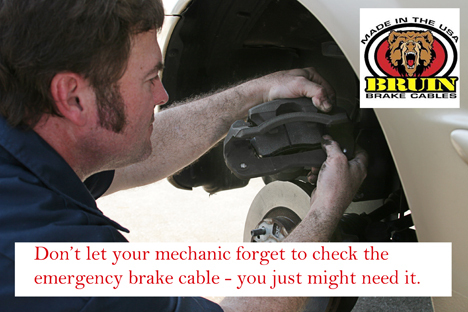 One aspect of automotive maintenance that is almost universally overlooked is the emergency brake cable. Over time, the cable can rust, usually where the brake cable connects to the fittings on each end. Denny Norton, owner of Performance Unlimited, a leading auto repair shop in McHenry County, IL, said it’s a good idea to replace emergency brake cables periodically. He said the industry recommends replacing the cables every 50,000 miles. It’s good sense, he said, because, though people don’t use their emergency brake cables often, when they do need them, it’s generally a critical situation. Rick Gelscheit, the owner of Fox Lake, IL, based Bruin Brake Cables, said all brake cables are not the same either. Many are mass produced with inferior results. Gelscheit said, however, that the manufacturing process is based on hand-crafted quality rather than mass production based on speed of production. Those mass-produced cables, built with a focus on quantity, in large, overseas factories, frequently fail the pressure test. As Gelscheit pointed out, that’s not good news for drivers should they need their emergency brake cables if their brakes fail.